Recently, I’ve been using my steaming basket quite often. For this recipe I decided to steam the diced celery root instead of cooking it in milk. One drawback of cooking in milk over low heat is, that it takes a very long time until the vegetables are really soft and I regularly have to look after the cooking process to prevent the milk from caramelization. Caramelized milk develops an odd unwanted flavor, which I try not to incorporate into my purees. The other advantage of steaming is, that the resulting celery root puree was much more dense and creamy as compared to the cooked version. In the near future I will use my steaming basket even more often for making purees. During plating I added some dollops of fresh goat cheese, which I sprinkled with pomegranate seeds, orange flavored melted butter and chestnut honey. For a crispy element I remembered my grandmother’s Pogácsa (small savory treats), which she used to sprinkle with buckwheat. So I briefly baked a few buckwheat seeds in the oven and sprinkled the plate with a few pinches of it. Each component of this dish paired great with all the other elements and made each bite taste slightly different, which helped to keep the dish interesting until the last bite. If prepared in a larger quantity, this dish can be easily turned into a vegetarian main course as well. Combine the buckwheat flour with the semolina, egg and egg yolk, a pinch of salt and the mild olive oil. Mix with a fork until combined and knead using your hands until the dough gets smooth a texture. Wrap in clingfilm and leave to rest for at least 30 minutes. Wash and peel the celery root. Dice and steam until very soft and tender. Chill to room temperature. Blend with 1 tbsp butter into a fine puree. Season with salt, pepper and freshly grated nutmeg. Cover a plate with clingfilm and sprinkle with some flour. Cut the dough into 3-4 pieces. Take one piece of dough at a time and cover the remaining dough with clingfilm to prevent it from drying out. Knead the dough once again and roll out the dough up to setting no. 6 on your pasta machine (almost the thinnest option). Add every 7-8cm 1-1 tsp celery puree. Surround the fillings with wet fingers and fold the other half of the dough on top of the fillings. Cut ravioli of about 6cm diameter and reserve on the prepared plate. Cover finished ravioli with clingfilm to prevent them from drying out. Fill the remaining dough similarly. Wash the orange with hot water to remove the wax from its skin. Peel the skin of the half orange and add to 2 tbsp warm butter. Add a large pinch of salt and infuse for 1 hour. Cover a grid with parchment and add the buckwheat. Roast in a 200°C / 390F hot oven shortly until they get crispy. Do not burn them. Remove the goat cheese from the refrigerator and allow it to warm to room temperature. Warm the orange butter. Cook the prepared ravioli in boiling salted water for 1-2 minutes. Drain shortly on kitchen paper and place 3-3 ravioli on warm plates. Add a few dollops of fresh goat cheese, sprinkle with chestnut honey and add 3-4 pomegranate seeds per heap. 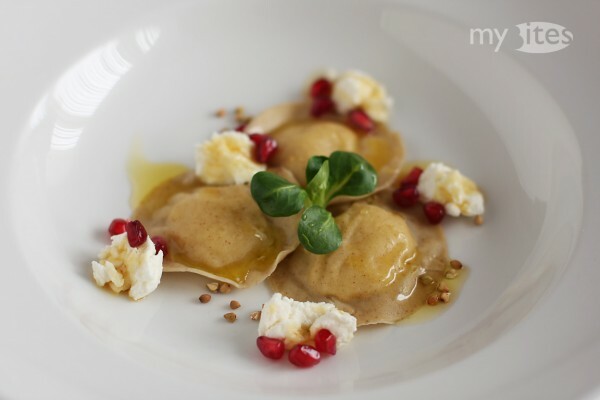 Sprinkle the plate with 3-4 pinches of buckwheat and add 2 tsp orange butter on the ravioli. Decorate with salad greens. I am so intrigued by every aspect of this dish! The buckwheat looks so delicious in the pasta. I’ve never made anything with celery root and am not even sure what to look for in the store (I’ll have to google it). It all just looks so healthy and full of diverse yummy flavors. Thank you! Thank you, Sarah! Well, the pasta could be called “soba ravioli” too – if this term existed, because the traditional Asian or Japanese soba noodles are made from buckwheat flour. Celery root is actually the part of the celery beneath in the soil. It can be kept for several month, so it’s usually concerned as a winter vegetable. Although, right now you can find beautiful young celery roots at the local market which have a milder flavor. This recipe has gotten me really exited. I love the subtle flavour of buckwheat and usually make crepes from it. I made a lasagna yesterday and started wondering whether I could make pasta from buckwheat – and now today I stumbled across you post. This cannot be a coincidence 😉 I am really looking forward to experimenting with your pasta recipe. Thank you so much for sharing! Thank you. Buckwheat lasagne is a great idea! I recently enjoyed one with whole wheat pasta, which added a nice nutty flavor. Buckwheat works similarly.